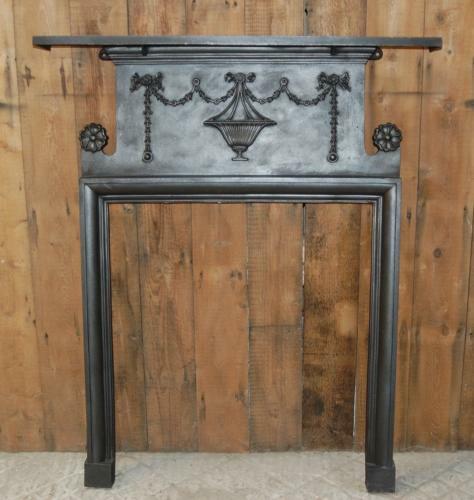 A cast iron, period fire surround dating to approximately 1905. The fire is decorative, with an Adam Style design under the mantel. The fire has an unusual design with a cast iron rose finials on each side of the fire. The mantel is heavy and solid and has fixing lugs to be set into the wall. The cast iron has been blacked and polished and has a rich finish and colour. The surround is suitable for use with a wood burner or fire basket. The fire is antique and therefore has some slight signs of use and wear. There are some casting marks and scratches to the iron. The back has surface rust as expected. A lovely period piece that would add great character to a home.